through a competitive Exam. 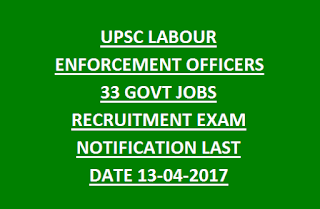 There are total 33 Labour Enforcement Office Jobs available in this UPSC LEO recruitment. Candidates who are having experience in Labour Laws, Labour Welfare, Personnel Management of Labour Relations and PG in relevant field they can apply online for this Labour Enforcement Officers jobs on or before 13/04/2017 through online via UPSC official portal @www.UPSC.gov.in. This Labour Enforcement Officers recruitment of UPSC LEO will be conducted in two stages such as written test or personal interview. UPSC Labour Enforcement Officer Complete information such as age limits, qualifications, pay scale and more information is given below. Notification of UPSC Jobs of Labour Enforcement Officers Recruitment 2017. Essential: Degree in Commerce or Economics along with one of the subject of Social Work/Sociology. And PG Degree or Diploma in any one of the Labour Related Subjects of Law, Labour Relations, Labour Welfare, Commerce, Labour Laws, Sociology, Social work/Welfare, Business Administration, Personnel Management. Desirable: Experience required in Labour related works. The candidate's upper age limits is on 30 Years. For SC/ST 5 years and for OBC candidates 3 years of age relaxation is given. Written test duration is 2 hours duration and exam paper will be in both English and Hindi. Written test will be conducted OMR based Pen and Paper mode. Multiple choice objective type test will be conducted. i) General English- English language & workman – like use of words. viii) Mental Ability & QT. x) Social Security in India. xi) knowledge of Computer applications. The candidates have to pay Rs.25/- fee can pay through online or offline and no fee for Sc/ST/women/PH candidates. Applications will be received through online only. Closing date for submission of application form online is 13-04-2017. It is mandatory to provide valid E Mail Id and Mobile number at the time of online application submission. Click here to apply online for the UPSC Labour Enforcement Officers Recruitment 2017. 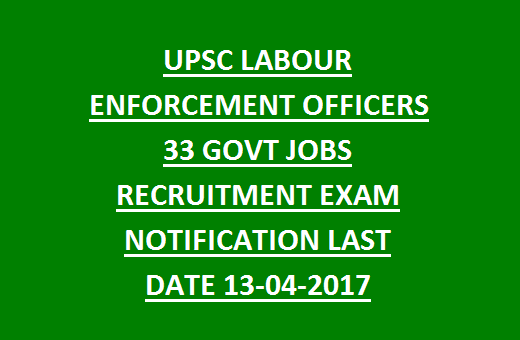 Please share this UPSC Labour Enforcement Officers jobs Notification 2017 article with your friends.